It's been many months since I last updated my blog, and whilst this has been on hold, my art making certainly hasn't. I moved house in November - we are now Faversham residents and settling nicely into this wonderful community. After a hiatus in making art, understandably connected with the upheaval of moving, I'm now able to dedicate proper time almost every day to making and exploring. I've been having 1-1 art lessons with fantastic Whitstable artist Tracie Peisley, who is helping me to spark new ideas and embark on adventures in paint and colour. I'm also very excited that I'll be getting my own garden art studio in a few weeks - we've ordered a luxury log cabin, which I've been saving up for for some time. Back to the art - I'm loving the surprises that come with just splashing paint around and applying mixed media.... some great, some not so great, that you put down to experience! I know this is enriching my frame of reference and experience and helping me overcome my nervousness of working in colour as monochrome is most definitely my comfort zone when it comes to my art, having a past firmly rooted in graphite pencil drawings. I will always love graphite on paper, and don't intend to move away from it completely. I'm always compelled by drawings in galleries. There is something so accessible yet beautiful about pencil on paper.... I can't quite put my finger on why. If you're quick, you can catch an exhibition of my wildlife art at Café Moroc, Rochester High Street, until the end of September. It features my detailed drawings of animals and birds: prints and originals are available. My artwork is the result of my passion for the natural world: an attempt to explore its beauty and fragility through the most detailed pencil drawings. The drawings are an attempt, through hours of painstaking work in the studio, to forge a long-lost connection to our animal cousins: the most vital living embodiments of Mother Nature. When I spend hours and hours drawing a subject, I feel I come to know them as an individual. I want that animal’s existence to be acknowledged: This is a creature who has his or her own subjective life experience, their own story - joys and sorrows (including, in some cases, their own captivity in zoos as exhibits). I want to communicate how each animal’s existence is as important to him or her, as ours is to ourselves and for us to value that accordingly. The exhibition is on at Café Moroc, 365 High Street, Rochester, ME1 1DA until 29th September. Over the spring and early summer, it was my goal to create a new range of greetings cards featuring cats, as many people have asked me if I 'do cats'! I thought it would be a nice touch to use 'real cats' belonging to my friends and family - whose characters and stories we might know something about. So I posted a request for people to share their photos of their cats on Facebook and I was inundated! Literally hundreds of photos all on one long thread! I was everso grateful, and it's lovely to see how much people clearly love their feline companions.... I honed it down to six individual cats in the end. We have Arthur, Lilo, Mia, Rufus, Starbuck and Theo. Here is Lilo's photo and the finished artwork. You can buy sets of the 6 different designs on Amazon while stocks last. 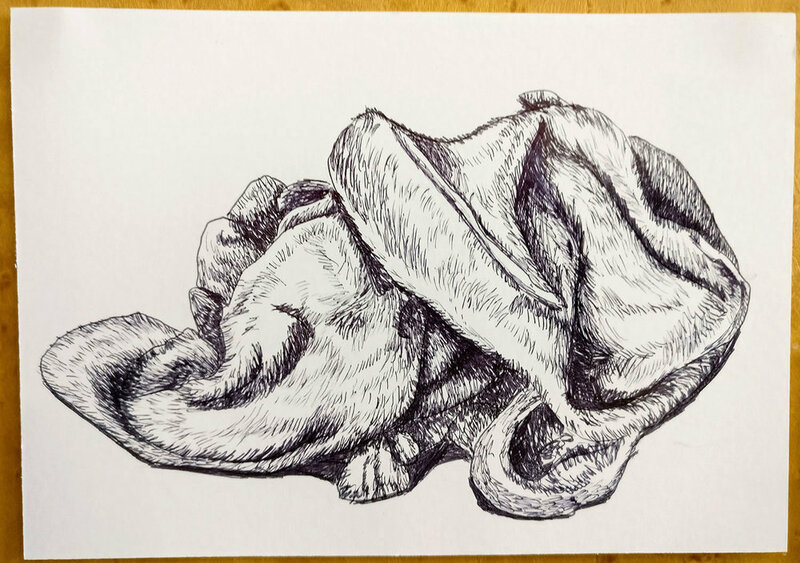 A couple of years ago, I began carrying around postcards and a biro in order that I could just draw anywhere, whenever the mood took me. It's something that I now do on a stop-start basis, and wish I had a little more consistency. As with most times I'm creating something, I enjoy the process, but somehow, there is always that 'something' that stops you from picking up your materials to start. Usually it's fear that your work will be no good - this is the reason I started doing this, as I put no pressure or expectations on myself - cheap materials that can be thrown away if you really don't like them. But my collection grew and grew and I didn't throw any of my drawings away, even if they weren't great. Some of them recorded my emotional and physical states at the time, others are more abstract and doodly, or simply observational. The images I've shared above are some of my favourites, but there are many more. I'm partly sharing this as I hope to inspire others to do similar, but also to remind myself of how fulfilling it can be, and how germs of ideas can grow from such work. It's the school holidays and I spent my first day alone with my 5 year old niece, who is really into art, and who, it seems looks up to her artist aunty Becky. So what better thing to do than to take her to spend the day at my art studio? She had a wonderful time - using clay, and for the first time, charcoal and pastels. It was great to just watch her create - she just drew and the work flowed out of her. She clearly just loved putting colours and shapes on paper. 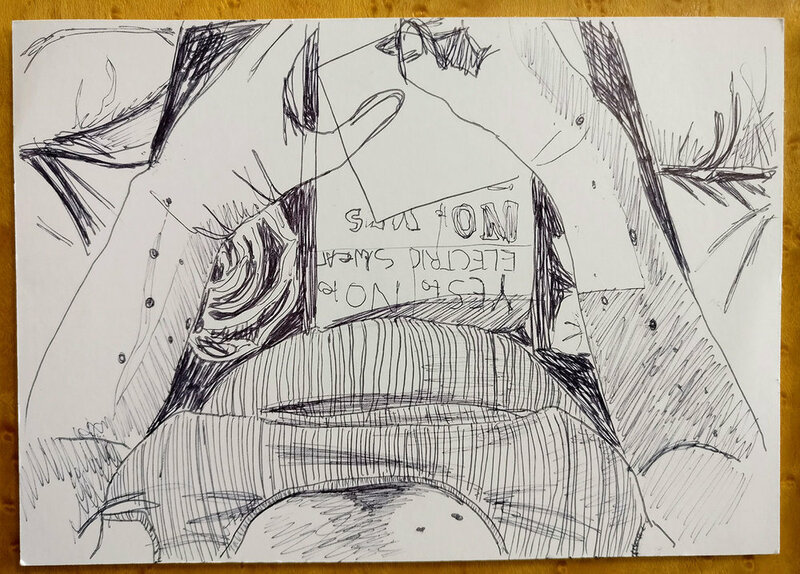 I'm guessing this is much what I was like back when I was her age and used to sit for hours on end drawing, most often watched over by my godfather and babysitter uncle Brian, who indulged me with art materials and attention. Interestingly, I saw the seeds of self deprecation, which I'm hoping she doesn't take too seriously - I was doodling alongside her, and when she saw my drawings, she was comparing herself to me - and of course as a 5 year old, coming up short (in her opinion)... It's sad that this starts so young: artists constantly have to unlearn and deprogramme these kinds of feelings from their psyches if they are to make art unencumbered, and few really manage it well. 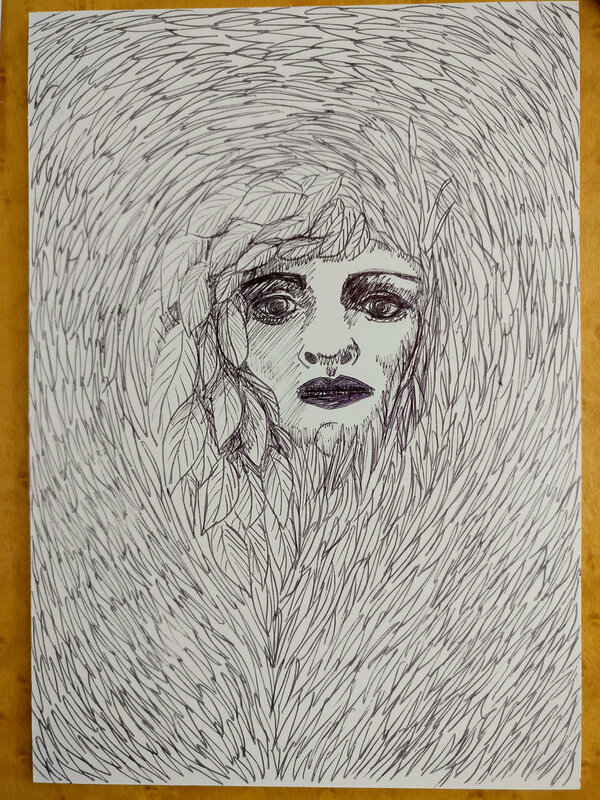 I encouraged her to use my drawing (below) as inspiration for her next piece, then I in turn used that as inspiration for my following piece. It was a lovely way to see how ideas can evolve and she produced a beautiful abstract pastel drawing. She took the circular motif as a basis for her pastel drawing, and chose a beautiful variety of pastels to create her abstract piece. It was an exciting way to create new work playfully. I loved the fact that she could have drawn all day, she was so absorbed in what she was doing. What is it about making art that can do that to us? There's such peace in us when we are fully engaged in making art - that's why I continue to do it - it feels so 'right' and I love the satisfaction of having created something at the end of it. Here (below) is a final photo of her and her finished pieces in the hallway at the studios where she left them 'for everyone to see'. Back in June I shared a video talking about my drawing of a sweet English Bull Terrier called Rosie, and discussing which materials I use. It's only just occurred to me to post the finished picture, now she's been handed over to my happy client.... This is an A3 drawing on Acid free Mellotex paper (very smooth and quite heavy). The photograph I worked from. Maidstone Vegan Festival has just celebrated its second year and has built on the success of last year, with over 1000 visitors and 40 stalls, talks and live music. I have been involved behind the scenes as I did all the graphic design for the festival, sponsored it, am on the organising committee, and also had a stall selling my cards and sculptures there! As ever, my cards sold like hotcakes, which was very exciting. My next steps are to get these cards available in retail outlets for people to buy. I currently sell two selection packs online at Amazon: Cats Selection pack and British Wildlife Selection pack In the meantime if you are interested in stocking my cards, please don't hesitate to contact me. All photos in this post are courtesy of Rich Lehmann of The Other Day Photography. A little belated, but it's been a busy time and I'm playing catch-up! Medway Open Studios which took place mid July over two weekends was a great opportunity for me to showcase my new fungus sculptures, as well as my new range of cat greetings cards based on my ink paintings. My greetings cards sold really well and I had some lovely responses to my new woodland display, which I trialled in my studio for the first time: a way of tying together my sculpture work with my British Wildlife range of greetings cards. I always love chatting with people about art - Open Studios can be a rather strange experience, as even though people have come to see your studios, and there are signs everywhere, they need to be encouraged into your room... I can quite understand how it feels odd just walking into a room with an artist sitting in the corner, so I do my best to encourage people in! As an artist, I know how interesting it can be to see how other artists work, and whilst I'm happy to share information, I'd never considered doing a video before. This is largely due to self-consciousness and the need to get my head around imovies (which I found rather un-intuitive). This effort is a beginner's go - I'm not a 'vlogger' yet! I hope this video is also something that my clients will enjoy - an extra insight into how I work. I plan to produce more videos in the future, talking about my story as an artist and featuring past and current work. Please let me know if there is anything in particular you would like to see/know more about.